"Our local running community is filled with many amazing individuals who consistently motivate and inspire others. My goal is to recognize those individuals, discover their uniqueness, and share it with the community. Each runner has a story to tell and I'm honored to bring their stories to you." Roy with his finisher's buckle for the Snowdrop Ultra Marathon. It's a new year! That means, new journeys, new friends, new experiences, and new Local Runner Spotlights! This month's Spotlight is a Co-Founder of Project Phoenix, Roy Orozco. Project Phoenix is an outreach group that provides inclusive events to it's members that provide a positive impact for the commUNITY. Roy began his running journey in 2012 when he started training for his first half marathon and since then has completed an estimated 25 full marathons, many many half marathons, and 11 Ultra Marathons. That's a lot of miles! One of his current goals is to run all the World Marathons and is currently registered to run the BMW Berlin Marathon in 2018! If you are in the running community here in San Antonio, you have likely seen some people wearing tech shirts or singlets with the Project Phoenix Logo (see Roy's Picture). Or, maybe you have seen some people running along the streets of San Antonio carrying the US Flag or the Back the Blue flag. If so, you have likely seen Roy. He has organized numerous charity events that range from donation drives to help the Homeless, toy and food drives to help families in need during the holidays, and blanket drives to help those that do not have shelter during our coldest months. On top of commUNITY charity, he has also helped to organize runs in memory of victims of some of our most tragic events in Texas. 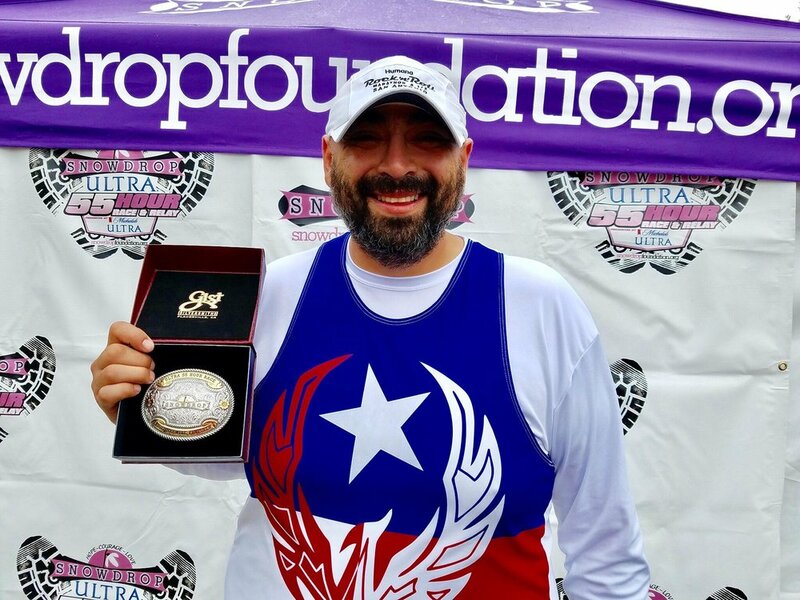 In July, he ran and helped organize an Ultra Road Marathon in memory of fallen Officer Moreno and in November organized a run from San Antonio to Sutherland Springs in memory and support of the victims and their families. Known for his leadership, Roy has motivated the Project Phoenix members to also take their own initiative to host their own meetups and organize community outreach events. There are many opportunities to meet up for a run, an event, or even a meal. If you are interested in volunteering or attending any of the free running and social meetups with Project Phoenix, find the Project Phoenix facebook group HERE. If you'd like to donate to help Roy achieve his BMW Berlin Marathon fundraising goal for the NY RoadRunners Team for Kids, click HERE. To find out why he started running, what he does to prepare for races, some of his most memorable runs, and the Taco Incident, listen to the audio below. *Note: I must apologize for all the background noise but you can still hear both of us clearly. One of the things I love most about the Local Runner Spotlight is that it allows me the opportunity to feature those that have inspired me on this running journey. I'm grateful that I am able to share their stories and contributions with our community. With that said, I'm excited to introduce this month's Spotlight, Julia Hargesheimer. Julia began her own running journey in college and has been an active member of our local running community in San Antonio for many years. She is an accomplished runner with a major love for the long run; having completed 8 full marathons and will be returning to run Boston in 2018. Julia is a wife to a very supportive husband and a mother of three children. Together with her husband, they work together to set a great example on the value of fitness for their family. They can often be found most Wednesday evenings at the SARR Zoo Run in Brackenridge Park as active participants. For Julia, running provides balance and a way to de-stress. It has allowed her opportunities to meet new people from many different backgrounds as one of things she likes best about running is the fact that it does not discriminate. Listen to the interview to hear about some of her race day strategies, what running has done for her, and her thoughts for the future of running in San Antonio. Since I started becoming involved with the local running community I have met so many amazing people that are an inspiration to myself and many others. Due to the overwhelming appreciation I have towards them, I wanted to be able to share their stories in what makes them amazingly unique and to highlight how valuable they are to our local community as a whole. These stories aren't just about running. They are about life, passion, dedication, and selflessness. This makes me extremely excited to kick off the series featuring my mentor, coach, and great friend, Coach Dawn Mathis. Dawn has been running miles and miles for 26 years starting her journey with her Cross Country High School Team. She has 17 Full Marathons under her belt which include high profile races such as The Bank of America Chicago Marathon and the Boston Marathon (3 times!). She participates in numerous races for charities throughout the year (see picture for the Alzheimer's Association Race to Remember 5K) and stays actively involved in the running community where you can catch her at meet ups and running events throughout the city. On top of being an active race participant, Dawn is a certified RRCA and USATF running coach as well as a member of the San Antonio RoadRunners (SARR). For the past two years, she has been the Head Coach for the SARR Fall Training Full Marathon Team. Additionally, she has been promoted to the role of Director of Coaches where she provides consistency in the coaching philosophies, guidelines, and schedules for the training programs and also offers guidance and mentorship to the SARR RRCA Coaches. Not only is Dawn an amazing coach and runner, she is also a loving Mother and Wife to four incredible children and a just as amazing dedicated and supportive husband. Dawn is natural motivator and continues to inspire those that she coaches with her experience, kindness, and genuine concern for the well being of the athletes she trains. I am extremely appreciative that Dawn was kind enough to meet up with me for an interview. Please take some time to listen to some of her running stories, advice, and her vision of the future for the Runners of the City of San Antonio. First Post Coming June 1st!